Every day after CrossFit, I drive by. The Windsor Mill. Destroyed by an arsonist(s) on August 6th, 2017. This weekend The Coloradoan ran an update story on the investigation. Windsor Police Chief Rick Klimek said the case is ongoing as is the investigation. They are still soliciting leads from the public. People with information about the mill fire can contact the police department at 970-674-6400 or windsorgov.com/89/Police. The ATF is offering a $10,000 reward for information leading to an arrest. Blue Ocean Enterprises, the owner of the Mill site, is still committed to re-building the site. However, there is no time frame. As one can imagine. Starting from square one is challenging indeed. However, hopes and dreams are still alive. 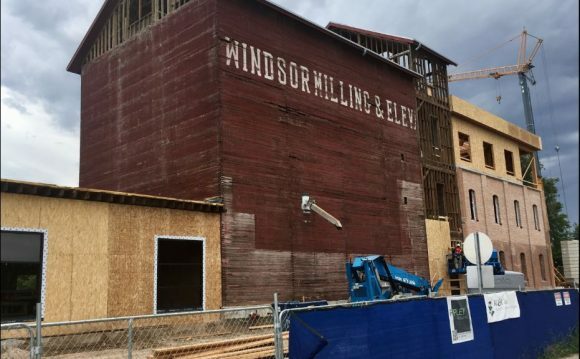 The Mill will return, becoming once again a vibrant part of our downtown and community. How sad. I hope it will be rebuilt. Thanks for following my blog, and for your like of my post, “The Bride.” I am very grateful to have you as a friend. Please have a good evening. I hope the person responsible for this damage has been arrested. And hopefully the people of the town will see a new Windsor Mill standing in its former glory, Bless you people and god bless America!